This is the next level up from the 2.0mm weight, and is in the upper mid level of the heavier chains in this series. This weight and diameter has a very substantial feel. 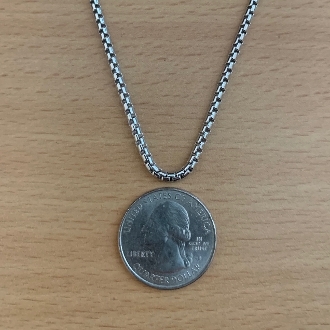 This chain is generally worn by men, though women do purchase this heavier chain when a substantial look is required, generally for larger items. The chain is an intergral part of the "setup with a pendant" in a visual sense, as does the 3.5mm also offered in this series.